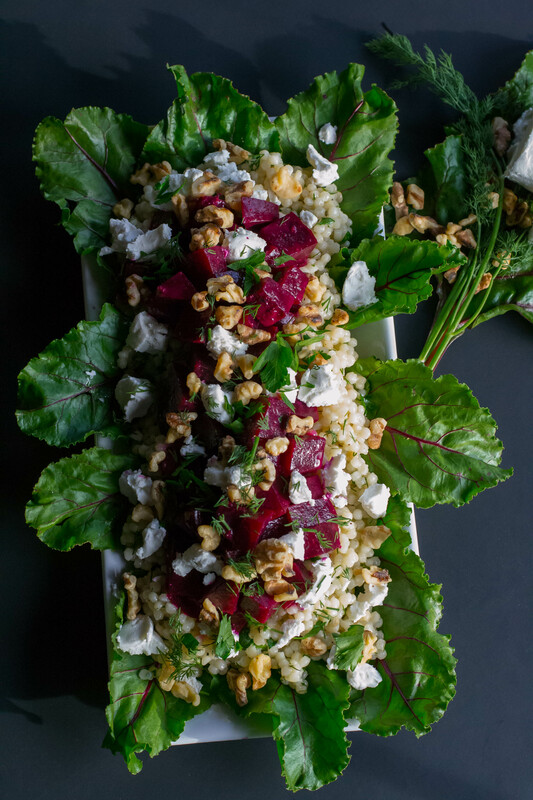 Roasted Beet Couscous Citrus Salad - What the Forks for Dinner? SPRING IS FINALLY HERE!!!!! Winter hung on way too long this year…. now that it’s finally gone…… I feel springy….salad springy. No ordinary salad. A pretty, light, and yummy salad. One that will take away any remaining winter blues. Roasted Beet Couscous Citrus Salad is that salad. 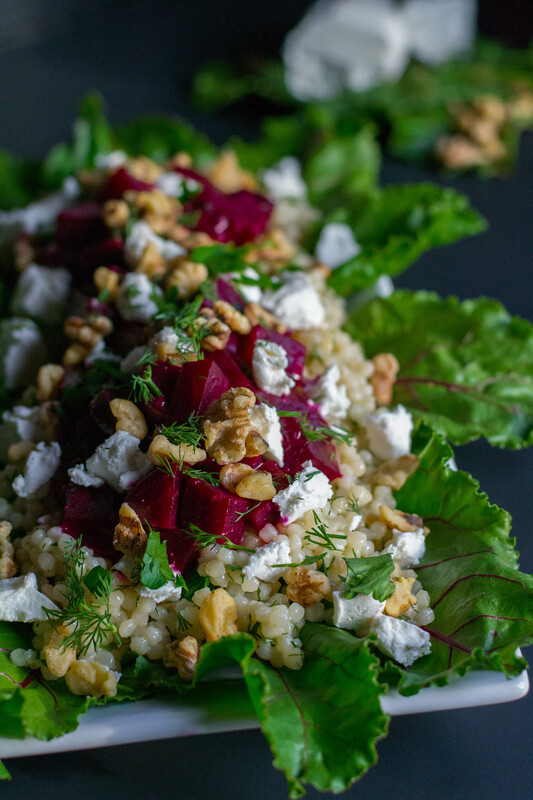 Creamy colored couscous, mixed with a citrus vinaigrette and herbs, and topped with vibrant red beets. Goat cheese and walnuts give a big tangy and crunchy finish. 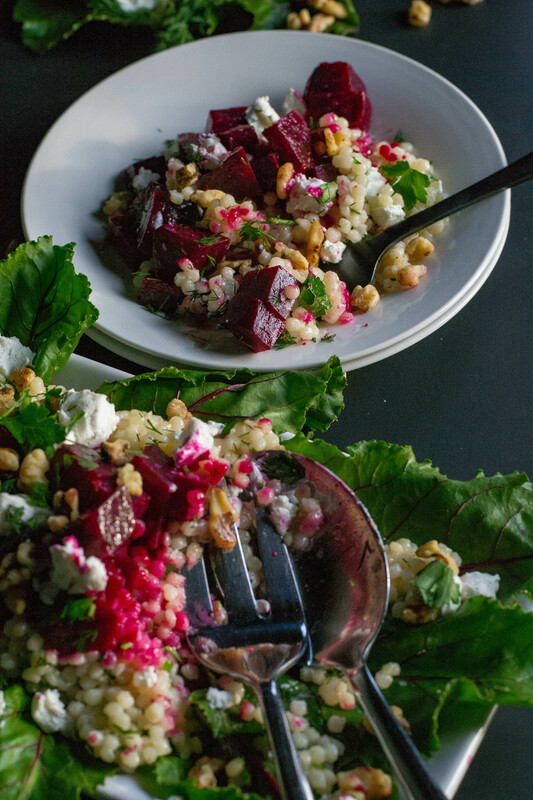 Beets turn the couscous pink as you spoon the salad around your plate. The dill and parsley give you a burst of spring green and a fresh herby taste. Citrus vinaigrette keeps that light spring feeling. I have a confession to make…….I am a Primenesia…..that’s right….I order so much from Amazon Prime……I don’t know whats in the box on my front porch. Sickeness or smart???? They have everything, you can order in your PJ’s and they bring it right to your front door!!!! I’m on a food buying binge (shhhh don’t tell Tim! )………I have been ordering food products that I cannot find at my local grocery store. I bought my couscous here. Israeli couscous is a pearl type couscous. I like it much better than traditional couscous, it’s slightly creamy, reminds me of risotto. It’s actually a type of pasta and gives this dish a little bed for the beets to rest on. Some foods just go together, a match made in culinary heaven….beets, goat cheese, and walnuts are a match made in heaven. 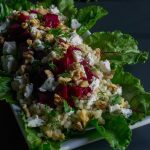 The sweetness of the beets and the tang of goat cheese create a delicious balance and walnuts give a warm earthy crunch. If you are over winter, try our Roasted Beet Couscous Citrus Salad for a little taste of Spring! Make the vinaigrette by combining orange and lemon juice, lemon zest, garlic, mustard, and honey in a blender or food process and blend well. Slowly drizzle in oil on the lowest speed until the mixture emulsifies and is pale yellow in color. Reserve. Chop roasted beets into bite size chunks and place in a medium bowl. Toss with 1/4 cup citrus vinaigrette, set aside. In a large bowl toss couscous with 1/4 cup citrus vinaigrette, 1 tablespoon each dill and parsley. Season with salt and pepper to taste. Set aside. To serve line a serving plater or bowl with washed dried leaves from the beets, or any large leaf lettuce. Place couscous herb mixture on top of leaves. Top with beets using a slotted spoon. 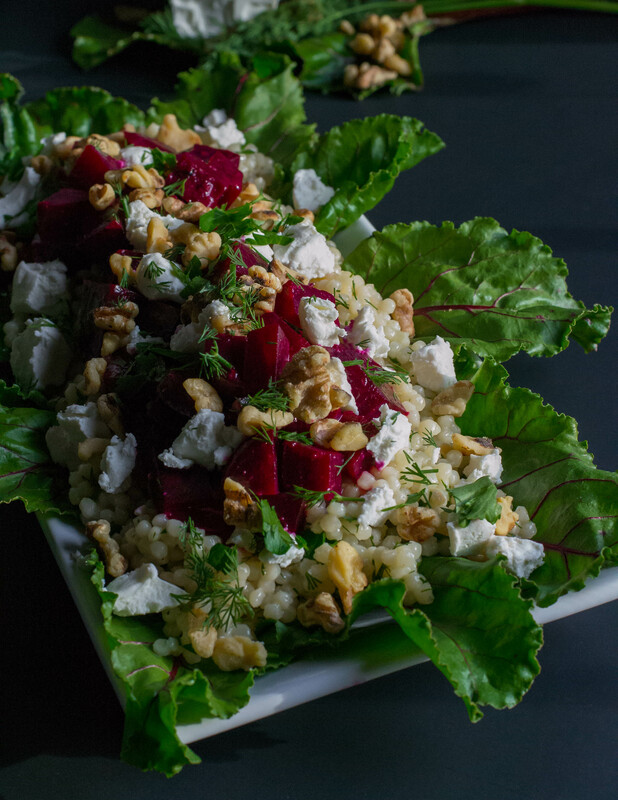 Sprinkle goat cheese and walnuts over beets, then garnish with remaining dill and parsley. Pass the remains citrus dressing. *To roast the beets, wash and snipe off leaves, leaving about two inches of stem, leaving the tap root intact. Line a baking sheet with tin foil. Use a piece large enough to wrap over the beets to form a packet. Roast in a 400F oven until they are easily pierced, about 1 hour. Remove from oven and let cool. When they are cool enough to handle, the skins will slip off.